The College Station Fire Department’s newest fire engine offers improved safety and visibility features, and its advanced technology enhances our ability to protect our citizens. The $638,000 Pierce Velocity engine went into service last week at Fire Station No. 4 near Easterwood Airport. The truck carries 500 gallons of water, pumps 1,500 gallons per minute, and has a compressed air foam system for the suppression of all types of fires. A part of CSFD’s 1979 recruiting class, Bart Humphreys (second from right) is retiring Friday. The Pittsburgh Steelers broke my heart by beating the Dallas Cowboys in Super Bowl XIII, 35-31. Sugar Ray Leonard won his first world boxing title. And Tracy Austin became the youngest U.S. Open tennis champion at 16 years old — not much older than me, a fourth grader in Breckenridge, Texas. That same year, Bart Humphreys began his career with the College Station Fire Department. After more than 35 years of service to the citizens of College Station, Bart will retire on Friday. To put that in perspective, he served under six fire chiefs and seven mayors. It’s hard to imagine CSFD without Bart. NOTE: 2013 marks the City of College Station’s 75th year as an incorporated city. In recognition, we’ve highlighted some interesting moments from our past. The following message was authored by Henry Mayo, a surveyor and long-time resident of the Bryan-College Station area. As a surveyor and historian, Henry retrieves information from local, state and national resources to assemble history-themed messages for email subscribers in a series titled “This Week in Brazos County History.” To subscribe to Henry’s email series, click here. This home and associated businesses have a rich history. In a 1995 interview archived on the City of College Station’s Project HOLD website, Marilyn Hrdlicka Fugate said she was born in the home on Feb. 22, 1922 and that it was built around 1919 by her father, Ed Hrdlicka. It was located on the west corner of a few hundred acres of land owned by the Hrdlicka family. Marilyn and her husband, Jack Fugate, raised their own family there following World War II. EDITOR’S NOTE: After 40 years as a firefighter, College Station Fire Chief R.B. Alley III retires on Friday, June 28. 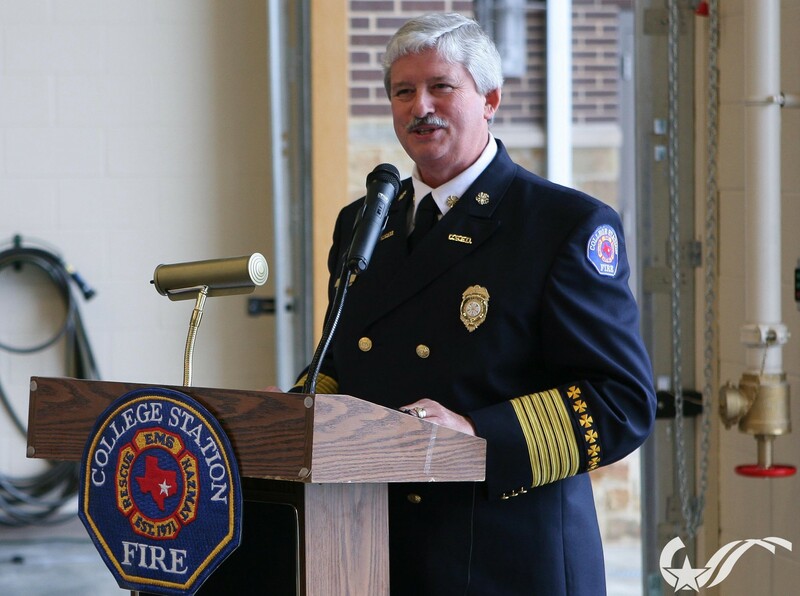 Chief Alley led the College Station Fire Department since 2005. In a way, he’s the Ted Williams of firefighting — Williams hit a homerun in his final major league at-bat; Chief Alley retires after recently being named Texas Fire Chief of the Year. In addition to his outstanding professional accomplishments, Chief Alley has been a tremendous ambassador for the City of College Station and will long be remembered for his contagious optimism and friendly demeanor. Chief Alley sat down with us last week to talk about his career and accomplishments. At 55 years old, you’re still relatively young. Why are you retiring now?